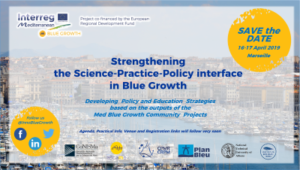 The InnoBlueGrowth project is holding a major conference focusing on ways to improve the Science-Practice-Policy interface (SPPI) in Blue Growth in the Mediterranean, on 16-17 April in Marseilles. The project, involving the CPMR as a key partner, is organising the conference to develop strategies that will strengthen the SPPI approach, based on the recommendations of the Interreg Med Blue Growth Community and its projects. It will aim to identify better methods and tools for successful knowledge and technology transfer towards knowledge-based decision-making processes. This capitalisation and community-building conference will also aim to increase awareness of blue growth projects among the public, and share knowledge among scientists, decision makers and entrepreneurs on key blue growth issues. Part of the discussions will also address more thoroughly the issue of training and education for the blue economy. The event will gather a wide diversity of stakeholders, from researchers to policy makers and donors from the blue economy sector of the Mediterranean region. Why is this event focusing on the Science-Practice-Policy interface (SPPI)? The blue economy, a sustainable ocean economy that balances economic activity with preserving the long-term capacity of healthy coastal and marine ecosystems, offers enormous potential for job creation and investment in the Mediterranean. To foster the blue economy, the integration of science into policy and practice to support evidence-informed decision-making is essential. However, new technologies or innovative methodologies developed by researchers are not always widely and quickly transferred or fully exploited by all stakeholders. Therefore, clusters or collaborative platforms to bring investors, funders, industry, public sector and other stakeholders together represent opportunities to bridge science to policy and practices frameworks through the exchange of knowledge and data and the tackling of sea and land-based challenges jointly. Responding to this need for collaboration, the lnnoBlueGrowth project has developed a Community of blue economy actors to support the activities of the thematic projects it works with in the Mediterranean. This innovative community, which has been running for over 24 months, has supported Mediterranean clusters in their transnational activities. Through the SPPI approach, the conference in Marseilles will offer opportunities to discuss ways to strengthen the SPPI in the blue economy and Blue Growth community frameworks, while highlighting the main outputs of the Blue Grow projects answering the issue. Part of the discussions will also further address the issue of training and education for the blue economy, which will serve as a strong basis to support the Blue Economy Summer School of this upcoming July 2019. The summer school will focus on youth opportunities and help bridge qualifications discrepancies in blue economy sectors. The Community Building discussions outcomes will fuel the training and educational Summer School roadmap by defining the specific theme courses and workshops that will cover several areas related to the blue economy, the analytical training programme, and the activities that will foster the team building sense among students. Therefore, sharing views, knowledge and experience in round-table discussions will be key to identifying the blue economy challenges and opportunities to be tackled through the Summer School initiative. This capitalisation and community-building event will involve the Blue Growth Community and its modular and integrated projects: iBlue, Maestrale, Pelagos, Proteus, 4Helix+ and Mistral. Check out the preliminary agenda for the event. And make sure to save your seat by registering as soon as possible.